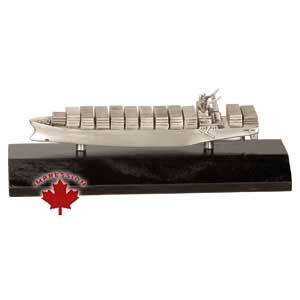 Custom Container Ship Figurine (this item has been made for one of our customers and is for reference only). Your logo can be placed on the ship's side and colour filled as long as there is no curve to the intended enhanced surface. 3-1/2" to 4" length $48.00 $43.00 $40.00 $37.00 each. 5-1/2" to 6" length $179.00 $163.00 $150.00 $145.00 each.